During the past months I have noticed that many people experience problems with discriminating a simian line from other unusual hand line types (such as the Sydney line, Suwon crease and the extended heart line). I hope that the picture (above) + descriptions will become usefull to recognize the essential differences between these 4 fundamentally different variants of the 'transversal palmar creases' - which all relate to the COMBINATION of the heart line & the head line! PS. A high quality version of the picture is available HERE. Regarding the difference between the 'extended heart line' and the 'Suwon crease'... the fundamental difference concerns that in the first there is just one (long) heart line + one normal head line involved, while in a Suwon crease the hand should display evidence of a fusion of two lines + one normal head line. But one also has to be aware that many heart lines show a 'splitting'. And regarding the 'Suwon crease', one should understand here that any 'Suwon crease' may look (at first sight) like a 'splitting'. - Therefore it probably requires some experience in analysing the details of heart lines & head lines, in order to be able to discriminate a 'splitting' (where the 2 resulting lines typically look weaker than the first homogenous part) from a fusion of two lines. - And regarding the second head line: one should also look for similarities with the other head line. So, if you understand what I have just described... hopefully you will now be able to recognize the fundamental differences between both variants, which is a requirement to discriminate an 'extended heart line' from a 'Suwon crease'. Martijn, how is the Suwon line different from a split heart line that has the split under Saturn, with an extension to Jupiter? If I saw that I would call this a split heart line with Hermt and Romantic Idealist. But that gives us no interpretation to use as handreaders! In practical handreading, like you I would tell clients about the forked heartline - in your terms the Hermit & Romantic Idealist type of lines. By the way Pamelah, thanks for your heartlines blog - I have included a link to it in my updated handreading course, and talk about your useful terminology in the heartline lesson. thanks clarifying Lynn. I think I'll stick with the heart line forked conversation since there isn't a conversation about what it means. It has to be similar to that anyway! have included a link to it in my updated handreading course, and talk about your useful terminology in the heartline lesson. Wow! Thanks Lynn. I'm glad it's so useful. That was my desire! Pamelah wrote: Martijn, how is the Suwon line different from a split heart line that has the split under Saturn, with an extension to Jupiter? If I saw that I would call this a split heart line with Hermt and Romantic Idealist. - Only if the structure of the line under discussion is likewise strong as the lower head line AND if the line is at least equal (or stronger) than the radial part of the heart line... then it meets all requirements to be called a Suwon crease. - However, if the line has a likewise structure as seen in the upper part of the heart line AND when it is clearly weaker than the lower head line... then it can simply be described as a 'splitting heart line' - and if the lower branch of the splitting heart line is reaching out to the radial side of the palm, then one can describe it as an 'extended heart line variant' that is featured with a 'splitting'. So this really requires a consideration of the structure of both the other heart line parts + the structure of the head line. Pamelah, have I been able to answer your question? Yes, Martijn. You answered it and as Lynn pointed out, what does it mean? I think I understand this Suwon Crease now. It must have a second head line, separate from the first, not joined, which joins the heart line. If it wasn't for this second head line appearing it would be a straightforward hand. As for what it means in palmistry interpretation Patti gave a long and interesting theory and thought it was getting to grip with things. Yes, sounds like my new picture was helpfull for you to understand the essential element: you've described it in your own words very well! But what is the Hal 600 or 900. Pamelah wrote: Yes, Martijn. You answered it and as Lynn pointed out, what does it mean? Sorry... I think your question regarding the meaning is a little bit too early: because we can only speculate about this, or present 'theoretical' interpretations. So far I have the impression that this line variant could be found more often in the hands of 'intelligent Beta-oriented males' with an introvert personality or a not very social oriented nature. I also think that this line variant has a more positive nature than the simian line & the Sydney line (which both are known in medical science as a 'minor physical anomaly'). ... However, I do have reasons to think that the Suwon crease could also be significant marker for Asperger's syndrome (= the high-functioning variant of Autism). But these are just a few associations based on the populations that I have studied so far. The 'Hal 9000 head line' is a very long head line which ends at a location below the center of the middle little finger... but this head line variant does not cross the full palm: because it does not end at the side of the palm like seen in the Sydney line. So... the 'Hal 9000 head line' is a little bit SHORTER than the Sydney line! Does this make sense now as well? Martijn, that should be little finger. Thanks Lynn, I have corrected the error. jeanette wrote: I think I understand this Suwon Crease now. It must have a second head line, separate from the first, not joined, which joins the heart line. If it wasn't for this second head line appearing it would be a straightforward hand. As for what it means in palmistry interpretation Patti gave a long and interesting theory and thought it was getting to grip with things. The Korean's wrote in their report that they believed the major creases being pulled to the radial side of the palm was related to strong hand grip. Hand grip is discussed in "The Psychobiology of the Hand" by Kevin J. Connolly. What I wrote was based on, or influenced by, these references. As far as relating it to behavior - there must be a reason we use terms like "getting a grip". I know, you know, that I think that some extended heart lines may be variants of the Suwon crease. This is because I think the heart line should not be located at the radial edge of the palm. I find this quote from Schaumann & Alter "Dermatoglyphics in Medical Disorders"
"The distal transverse crease is located between the proximal crease and the heads of the underlying metacarpal bones. Starting ordinarily in the space between the index and middle fingers, the crease curves gently proximally, ending on the ulnar edge of the palm." Also, on page 109, Fig. 5.5 illustrates variations of the simian or single transverse crease. Example A and E both have what they call shortened proximal transverse creases with lengthened distal transverse creases extending the width of the palm. In my opinion, when and if the Korean's develop a list of variants of the Suwon, examples A & E will be variants. These examples can clearly be described as II + III with Accessory II. 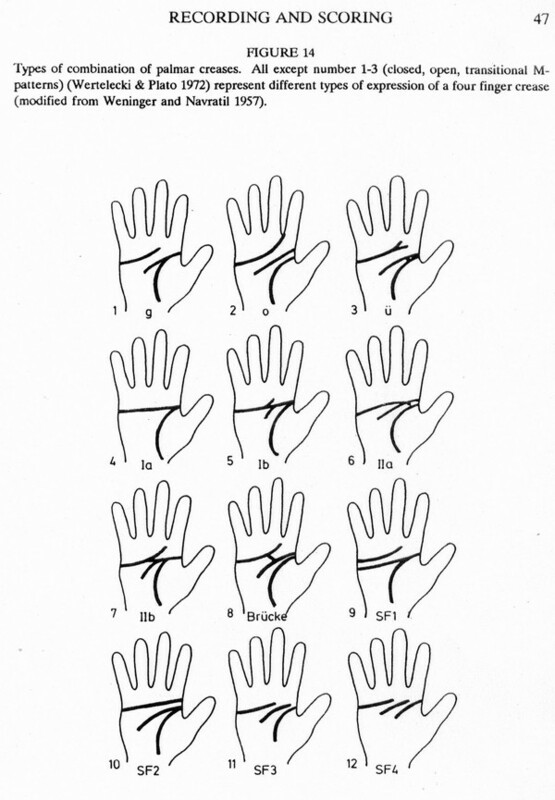 The Koreans have defined the creases that transverse the entire palm as II + III. Notice how Number 10 with its extended transversing distal crease follows Number 9 with its extended transversing proximal transverse crease. This is how I see the Sydney and the Suwon as 'cousins'. Number 9 is II + III with Accessory III and Number 10 is II + III with Accessory II. Numbers 1 - 3 show the normal distal transverse creases. Patti.... sorry, but I don't see how the quote supports your view. The word 'ordinarily' clearly suggests that the quote only describes where a heart line typically starts; but there are for sure many other locations where it can start. And by the way, the comment about example A and E in figure 5.5... directly refers to the work of Leiber, while Schaumann & Alter only summarize some elements from his work - but Leiber's work origins from 1960 when the Sydney line was not yet even identified. Just like in our fingerprints discussions, it is important here to notice who writes what ... and when! Anyway, I think your opinion about those variants (as representing a Suwon crease) is completely unlikely: simply because those variants (A and E) clearly refer to the presence of an INCOMPLETE head line (they call it a 'shortened proximal crease'). While the concept of the Suwon crease clearly refers to the presence of a COMPLETE (accessory) head line. Sorry Patti, I can only conclude that in your speculations you are ignoring some very obvious details in these materials - because your ideas do not acknowledge the essential difference between a COMPLETE head line and an INCOMPLETE head line.